Home Other Articles Sun Bear: What Is a Sun Bear? 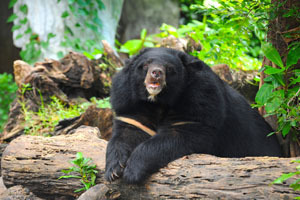 The Sun Bear (Helarctos malayanus), sometimes known as the Honey Bear, is a bear found primarily in the tropical rainforests of Southeast Asia. The Sun Bear stands approximately 1.2 m (4 ft) or maybe larger in length, making it the smallest member in the bear (Ursidae) family. Males tend to be 10-45% larger than females; the former normally weigh between 30 and 60 kg (66-132 lb), and the latter between 20 and 40 kg (44-88 lb). The Sun Bear possesses sickle-shaped claws that are relatively light in weight. It has large paws with naked soles, probably to assist in climbing. Its inward-turned feet make the bear's walk pigeon toed, but it is an excellent climber. It has small, round ears and a stout snout. The tail is 1.2-2.8 inches (3-7 cm) long. Despite its small size, the Sun Bear possesses a very long, slender tongue, ranging from 8 to 10 inches (20-25 cm) in length. The bear uses it to extract honey from beehives. Unlike other bears, the Sun Bear's fur is short and sleek. This adaptation is probably due to the lowland climates it inhabits. Dark black or brown-black fur covers its body, except on the chest, where there is a pale orange-yellow marking in the shape of a horseshoe. Similar colored fur can be found around the muzzle and the eyes. These distinctive markings give the Sun Bear its name. The diet of the Sun Bear varies widely and includes small vertebrates, such as lizards, birds, and other mammals, in addition to fruits, eggs, termites, the young tips of palm trees, nests of bees, berries, sprouts, insects, roots, cocoa, and coconuts. Its powerful jaws can crack open nuts. Much of the Sun Bear's food must be detected using its keen sense of smell, as its sight is poor. The Sun Bear does not hibernate, and, as a result, it can reproduce year-round. The offspring reach sexual maturity after 3-4 years and may live up to 30 years in captivity. A female Sun Bear can produce 1 to 2 cubs per year. Sun Bears undergo a roughly 96 day gestation period after which the 300 to 400g cub is born blind and hairless. The cub is initially totally dependent on its mother and suckling can continue for about 18 months. After 1 to 3 months, the young cub can run, play and forage near its mother. Male Sun Bears grow larger than females. Females are observed to mate at about 3 years. During time of mating, the Sun Bear will show behavior like hugging, mock fighting and head bobbing with its mate. Being a primarily nocturnal creature, the Sun Bear tends to rest during the day on lower limbs not far above the ground. Because it spends so much time in trees, the Sun Bear can sometimes cause damage to private property. It has been known to destroy coconut palms and cacao trees on plantations.